Fantastic range of games on downloadable client. Excellent Sloto Cash Casino VIP Club. The purpose of our Sloto Cash Casino review is not only to tell you about what a great site this is (which it really is), but also to inform you of a few terms and conditions you might overlook when first signing up for an online casino account. For example, some of the bonuses are country specific. So take a look at some of our other casino reviews if you live in Bulgaria, Greece, Hungary, Poland, Portugal, Russia, Sweden or the UK. Our Sloto Cash Casino review has also looked beyond the headline promotions to find out if the site´s claim it offers “the best bonuses online” is really true. We investigate the ease of getting your money onto the site – and back off again – and whether or not you will truly feel like a VIP when you join the Sloto Cash Casino VIP Club. First a little bit of background info. Sloto Cash Casino is a well-established online casino that first went live in 2007. It is licensed in Curacao and accepts players from most jurisdictions – sadly not if you live in New York, Kentucky, Washington State, Maryland, New Jersey, Louisiana Missouri, Moldova or Israel. Other than that, everybody is welcome, although read the terms and conditions first if you are joining solely for the bonus offers. Sloto Cash Casino has a downloadable client for Windows, an Instant Play version for Mac, and a mobile casino app for iOS and Android devices. The full downloadable client has a fantastic range of slots, table games, video poker games and specialty games. Not all are available on the Instant Play version of the software, and the mobile app is limited to slots and Blackjack. The downloadable client also has a Live Dealer section with live games of Baccarat, Blackjack, Roulette and Casino Hold´em. Being a predominantly slots-based venue, the focus at the casino is naturally on the complete range of RTG slots. There are dozens of 3-reel, 5-reel, and 6 reel games to choose from – many offering free bonus rounds – including a good range of progressives. The site also hosts daily and monthly slots tournaments – some of which are free to enter, while others have prize pools up to $2,000. The headline promotion at Sloto Cash Casino is a variable percentage match on your first five deposits up to a maximum of $7,777. The bonus has very generous playthrough rates of 25x or 30x the deposit and bonus amount (slots only – playthrough rate depends on the bonus percentage), but the bonus amount itself cannot be cashed out. The same applies to the $1,000 first deposit Casino Games Bonus. Players looking for cashable casino bonuses are better off investigating the weekly promotions. These offer slots-exclusive bonuses of up to 225% and casino games bonuses of up to 100%, with some playthough rates as low of 10x the deposit and bonus amount. There are also plenty of cashback, free chip and mobile-exclusive bonuses made available to players every month. The casino offers players a wide variety of deposit options. Players in the States can use Visa, MasterCard, Amex, Direct Money or Bitcoin to fund their accounts. Players from the rest of the world can add Neteller, Skrill and EcoCard payments to the list of deposit options. Deposits are instant and free of charges, although card providers in the States may charge you a small cash advance fee. This is not the only Sloto Cash Casino review to state that withdrawal request are dealt with promptly. Many people have had a positive experience withdrawing their funds from the site. You will need to verify your identity before being allowed to cashout, and limits apply to how much you can cash out in one go depending on the withdrawal method used. There are fees for cashing out by bank wire and couriered check, but every other withdrawal option is free. Daily deposit and weekend bonuses plus free spins. Comp Points awarded for all bets at the casino. Monthly cashback of up to 15% on net losses. No max bet rule at Platinum VIP Level or higher. It is well worth aiming to reach Platinum VIP level because the $10.00 max bet rule can delay the clearance of every Sloto Cash Casino bonus, and getting rid of it will accelerate the clearance of all your bonuses at the site. It will also mean you are able to earn comp points quicker and at a lower rate. Comp points have a cash out value of $1.00 per 100 points – a lot better than many other casino sites. The customer support is exceptionally accessible. Knowledgeable staff are available via Live Chat, Skype and phone (toll-free in USA) 24/7. There is also an email service for non-urgent enquiries and ID verification, and an extensive FAQ section on the Sloto Cash Casino website. Please be aware that Live Chat can get busy at times as some bonus offers have to be activated by Live Chat support. 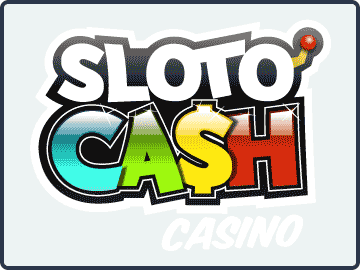 What we liked and disliked about Sloto Cash Casino are based on our own personal experiences of using the site and some of the points we picked up on that readers really need to know about. Not everybody will share our views, but – as experienced online casino reviewers – we feel it is better to give new players reasonable expectations. Excellent RTG software on downloadable client. Particularly liked the Live Dealer. Daily reload bonuses with low deposit requirements (from $10.00) and low playthrough rates. VIP Club is excellent for players reaching Platinum VIP Level. Bets over the $10.00 max bet rule will not count towards clearing the bonuses. Lack of native Mac client. Instant Play is available and okay, but not as feature-rich. The “sticky” non-withdrawable bonuses were not always made clear. We like this casino. We feel its “the best bonuses online” claim is probably true (we have a few reviews to do yet) and players have a good choice of options to clear them. We liked the slots tournaments, we liked the Sloto School with its great tips for playing slots, and we liked the Live Casino – although not all your action at the live casino will contribute towards clearing the casino bonuses. Overall, we recommend Sloto Cash Casino for anybody with a Windows PC and a medium-sized bankroll. The advantages of playing at the casino really kick in once you reach the Platinum VIP Level of the VIP Club; so, once you have created your account and funded it, be sure to verify your ID as soon as possible in order to start getting the best from the site as soon as possible. Visit Sloto Cash Casino Now!